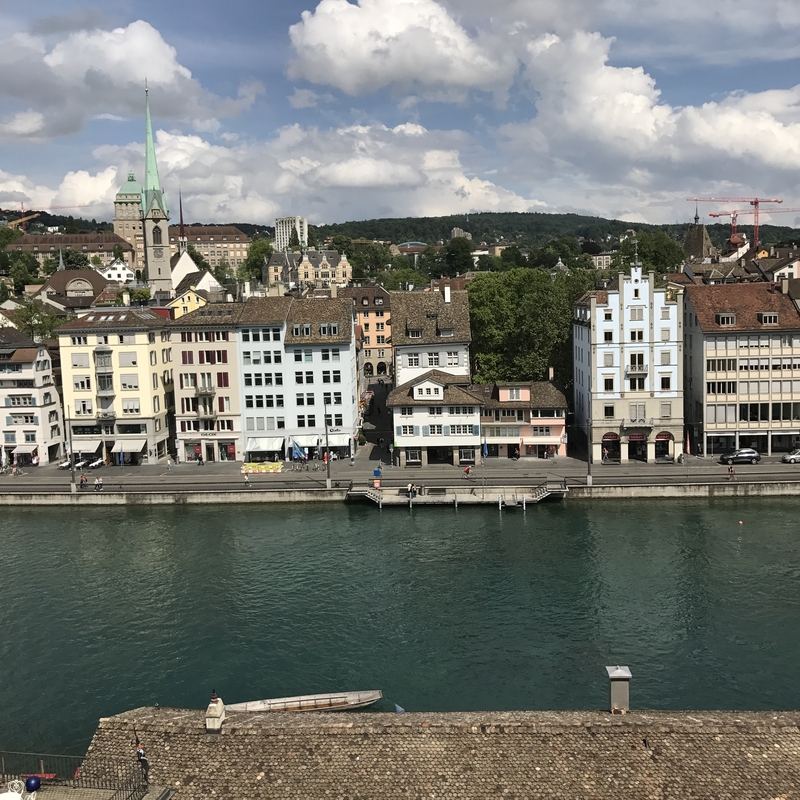 Zurich, Switzerland – a place I never thought I’d have the pleasure to get to know. It was honestly not a city I included on my Top 5 to-go lists (I’m still working on my international edition). 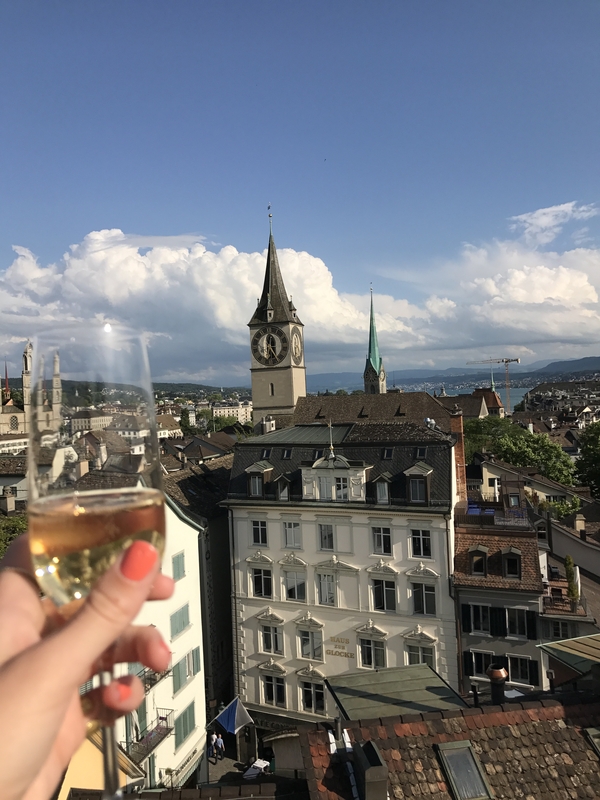 But when finding out I got the opportunity for fly into Zurich and stay for a couple days before venturing on to Milan for a work event, I was so excited! 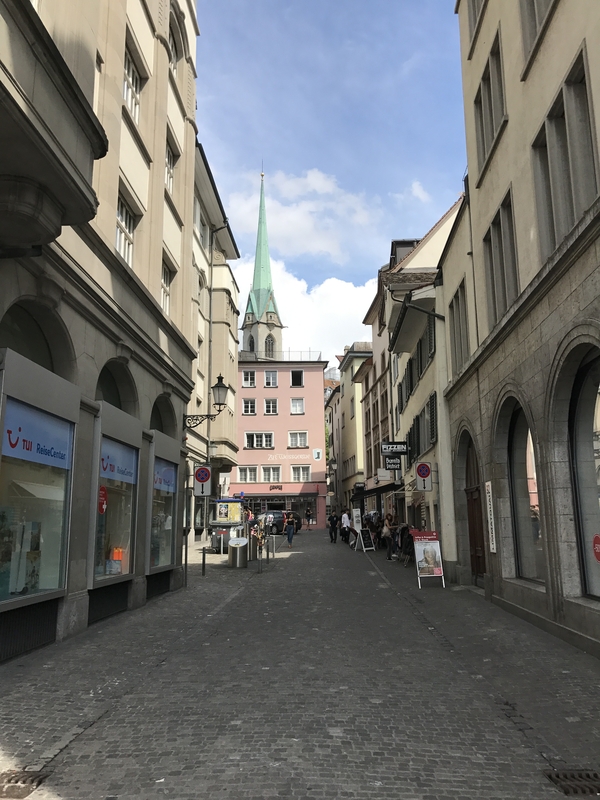 I didn’t do any sort of research on Zurich, but figured it was a walkable city that I’d get to explore on my own terms. We were lucky enough to have good weather during my stay and was right that it is so a city that you can see on two feet no problem. Right on the edge of the city is properly named Lake Zurich. 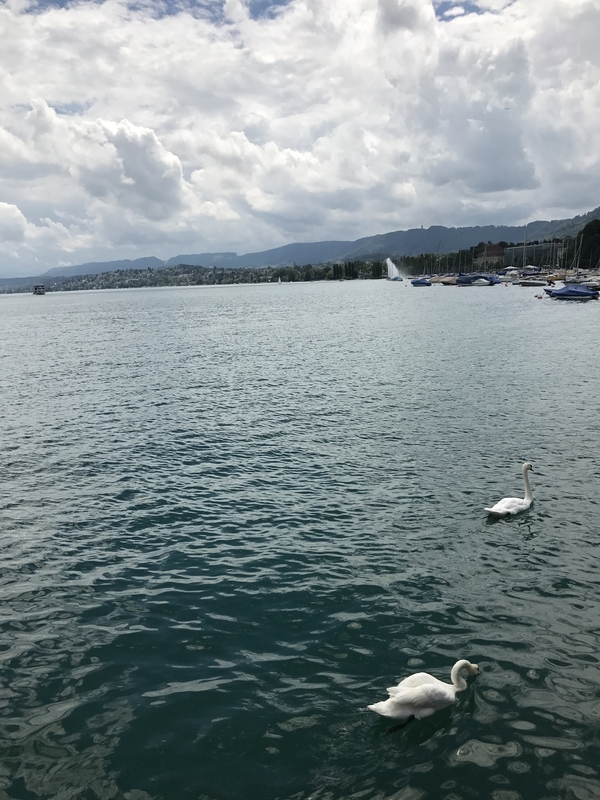 You can tell that the water is so clean and swimming is known to be super popular in the summer months – just like the beautiful white swans in the picture below. Far in the distance, on a clear sunny day, you can see the peaks of Alps. 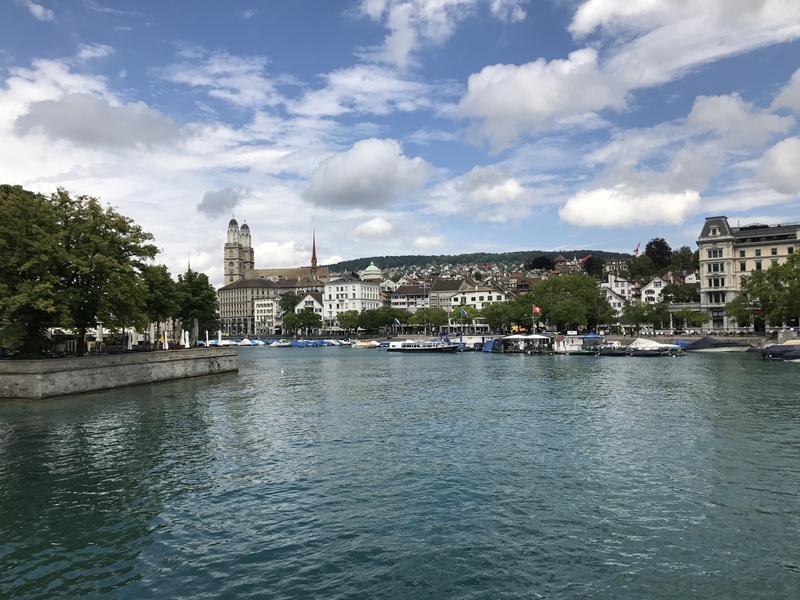 Zurich also has a wide canal running through the middle of the city – the Schanzengraben Canal. Now that’s a mouthful. It provides for a lovely walking path and there’s plenty of cafes to grab a quick bite if you get hungry. 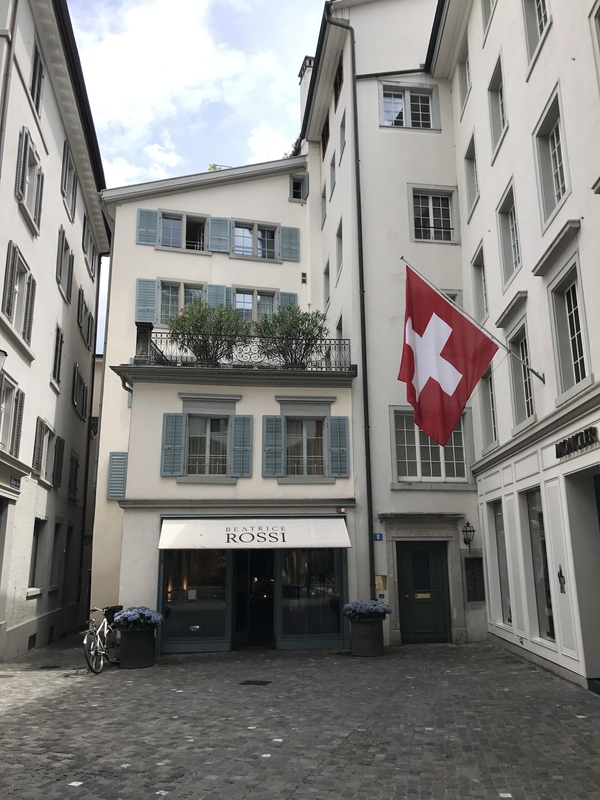 The Swiss sure are proud of their city, and it shows around every corner. Coming from a family that makes flags for living (not a joke), I can really appreciate this. 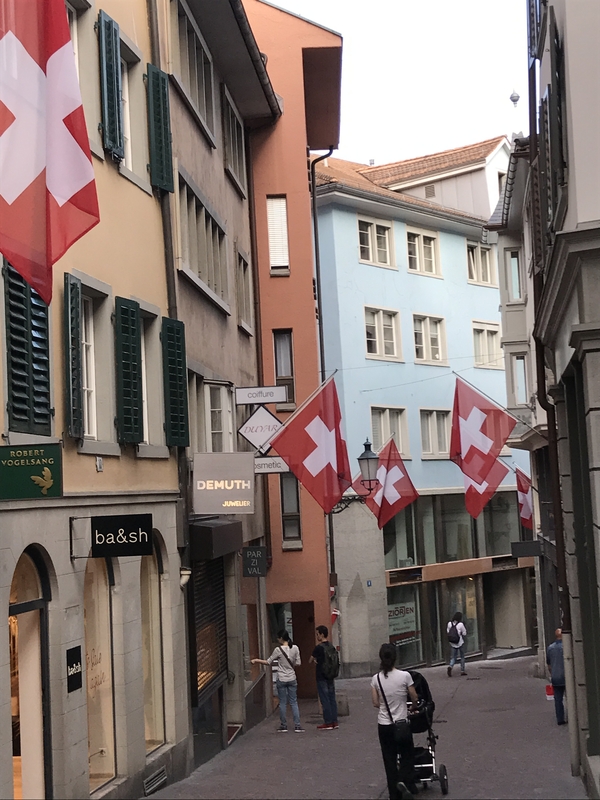 The flags flying high really gave this already cute city even more attractiveness. Also on every block is a building with a rooftop. I know this because our hotel had a rooftop and I could look far off into the distance and see everyone else’s. 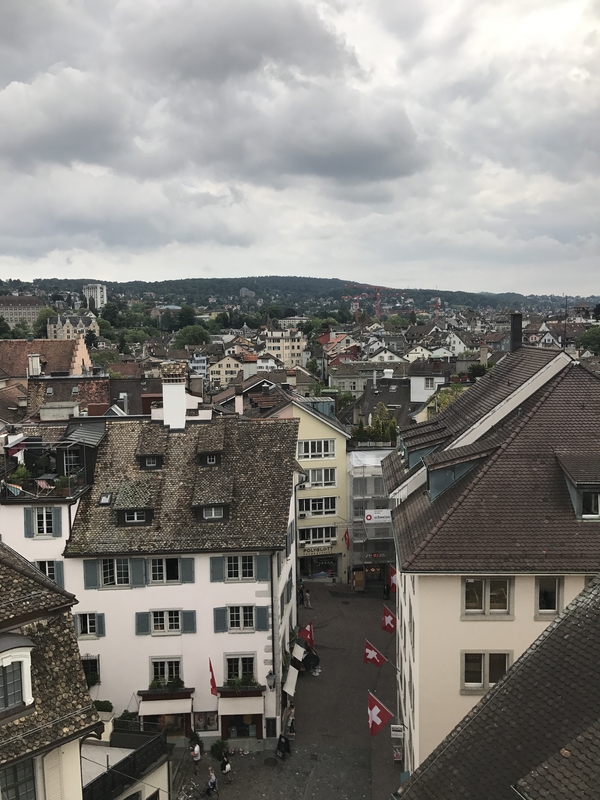 The Swiss must love their balcony hangs – we certainly made use of ours. We enjoyed a little bubbly, taking pictures and chatting away up there. We even watched a storm roll in. I think every path I walked on was cobblestone. Can you get any more historic than that? 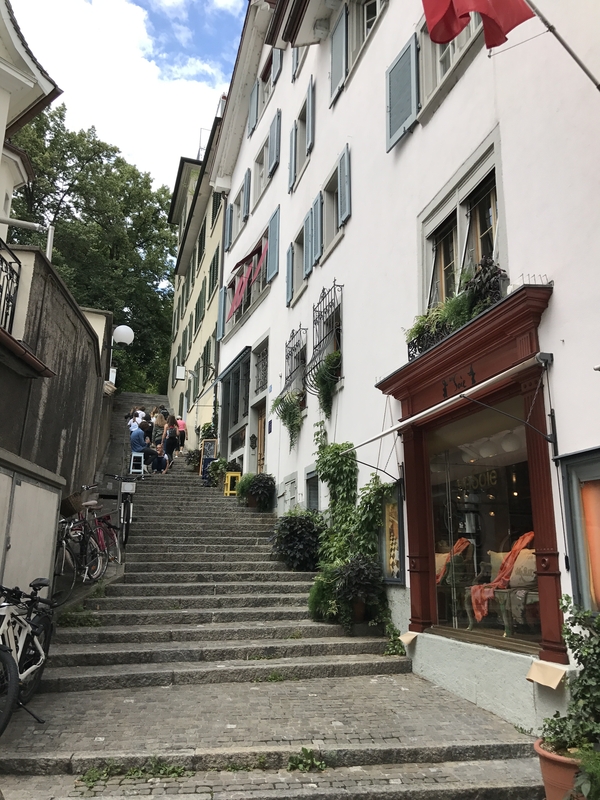 It was just one minor detail that added to the overall charm of Zurich. 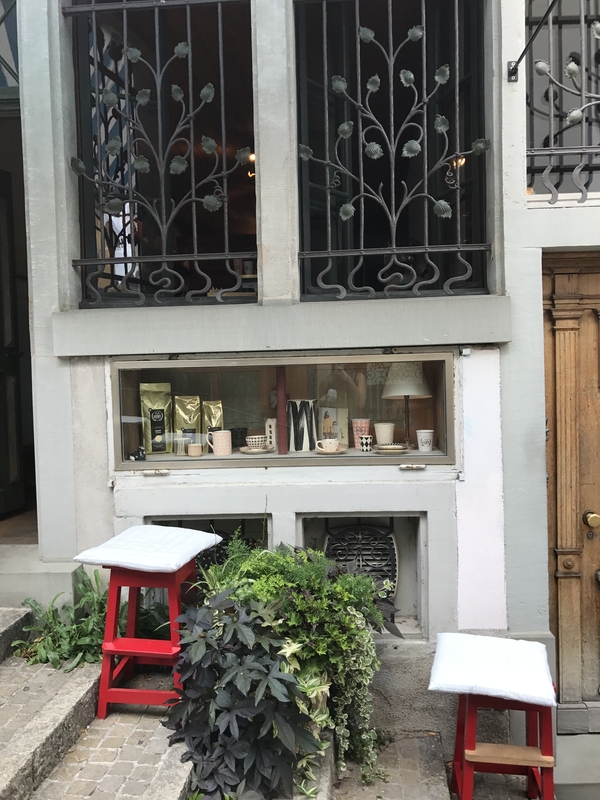 While it may not be known as a fashion capital, there are certainly cute shops everywhere. 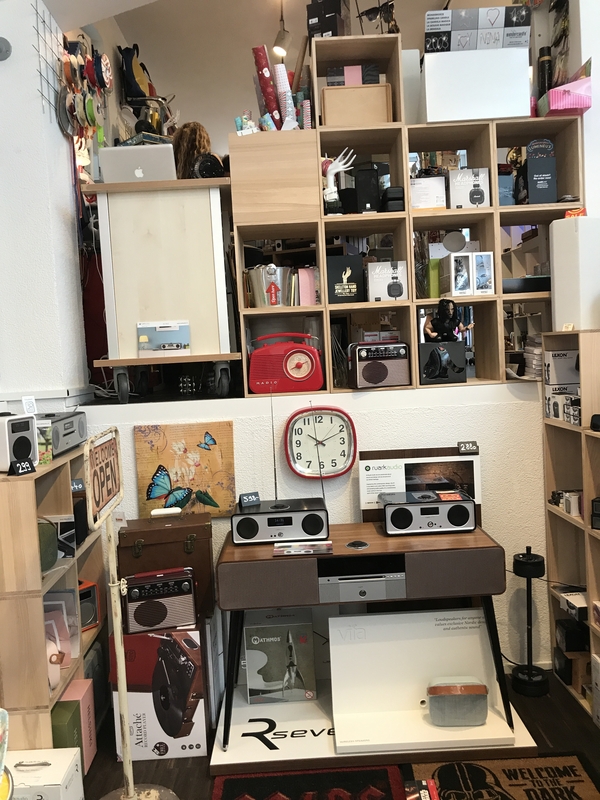 Be sure to check out Swiss army knives, Swiss watches and of course, Swiss chocolate. 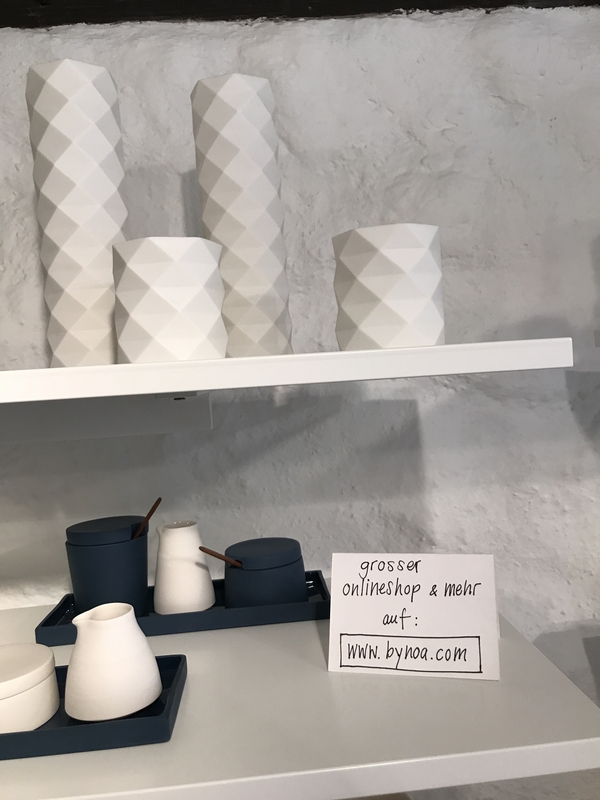 It may be expensive, but it is so fun to browse. 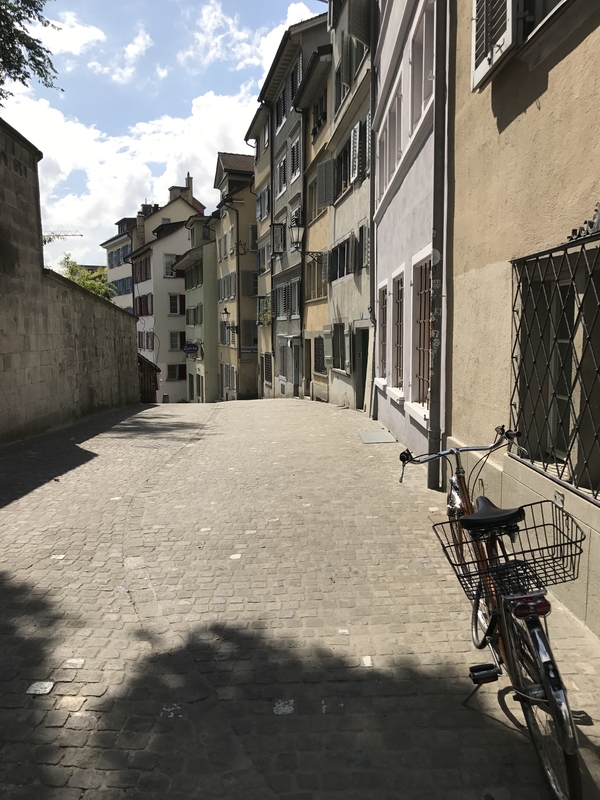 Overall, I thought Zurich was one of the most clean and pleasant cities I’ve visited. 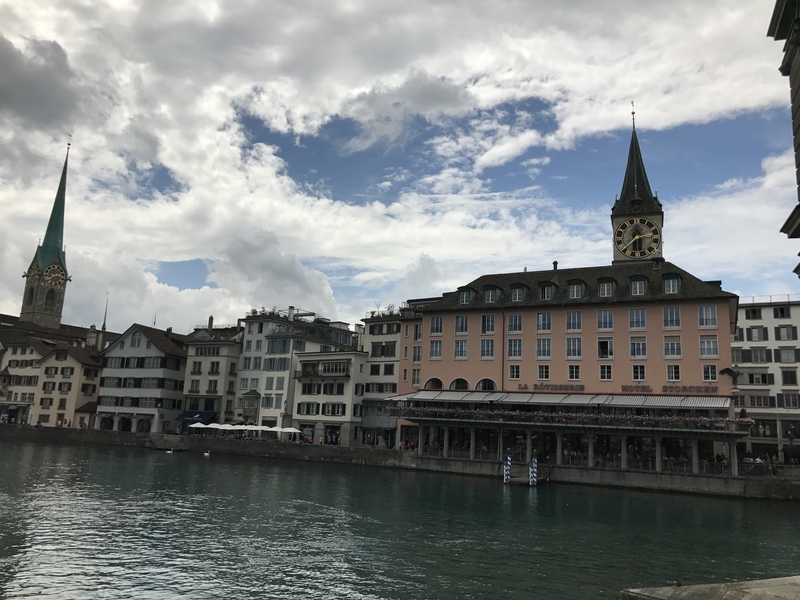 Now that I’ve got to learn a little bit more about Swiss culture, I’d love to go back to Switzerland and see more of the gorgeous Swiss Alps!